Posters of Dr Kwabena Duffuor are making rounds on social media with the clearest indication yet that he will contest National Democratic Congress’ presidential primary on December 7, 2018. According to sources, he will serve the party a formal notice of interest in the coming week. The former Finance Minister and Governor of the Bank of Ghana is, however, yet to personally confirm or deny the fliers. The NDC is scheduled to elect its flagbearer for the 2020 presidential elections as greenlight has been given for interested aspirants to campaign. Already, some party stalwarts including Joshua Alabi, Dr Ekwow Spio-Garbrah, Sylvester Mensah and, quite recently, Alban Sumana Bagbin, have given indication of contesting the primaries. 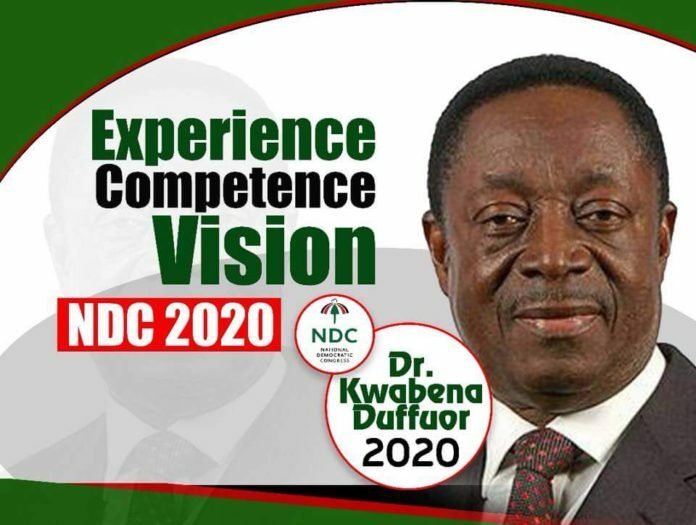 Though Dr Duffuor is gearing up to make his aspiration formally known, the posters are said to have been thrown into the cyberspace by his supporters – calling themselves Volunteers for ‘Dr Kwabena Duffuor for President – to get him to declare interest in the race. The posters underscore the banking expert’s experience, competence and vision. “In 2020, the right of the Ghanaian electorate to an effective, selfless and efficient government would be realised,” Dr Duffuor’s supporters said in a release on Tuesday. Dr Duffuor is well known for managing the local currency for years as head of the Central Bank under the JJ Rawlings’s regime. He was made Minister of Finance in the return of the NDC in 2009. He served for four years and left office in 2013 when John Dramani Mahama led the next NDC government. He, however, ventured into business entrepreneurship, setting up defunct uniBank Ghana Limited as part of House of Duffuor Assets Holdings.